The aims of these guidelines are to present the evidence base for the practice of administering supplemental oxygen to children outside hospital and to make recommendations for best practice. For many aspects high-quality evidence is lacking, and suggestions are made based on clinical experience. It is hoped the guideline will highlight areas where research is needed to further inform clinicians. The target audience is clinicians who prescribe home oxygen for children, principally those in hospital practice. It is also intended for other professionals involved with the whole process, which may include community paediatricians, paediatric neurodisability specialists, nurse specialists, school nurses, occupational therapists and physiotherapists; this is reflected by the multidisciplinary nature of the guideline committee (section 13). The initial literature search was carried out by the Centre for Reviews and Dissemination at the University of York. Further searches were then carried out by members of the working group who concentrated on their own topics. Details of the search strategy are given in Appendix 1 available online. Each section of the guideline was researched and drafted by a subgroup of the Paediatric Section of the British Thoracic Society (BTS) Home Oxygen Guideline Development Group (itself a subcommittee of the BTS Standards of Care Committee). Publications were rated according to the SIGN 50 criteria for the calibre of the methodology of the research to give levels of evidence (see box 1). Once all parts were merged into one document, the whole group then met to discuss the first draft before redrafting took place. This draft was based, where possible, on the published evidence, but this was then combined with clinical expertise as required. The resulting draft is therefore a blend of published evidence and clinical experience. This was sent to a group of specialist reviewers listed in the Acknowledgements. The manuscript was then amended in the light of their comments and the document was reviewed by the BTS Standards of Care Committee and the Quality of Practice Committee of the Royal College of Paediatrics and Child Health. After a further redrafting and final approval from the BTS Standards of Care Committee, the guidelines were submitted for publication. ✓ Recommended best practice based on the clinical experience of the Guideline Development Group. Background facts are shown in the text in italics. Recommendations are shown in bold and placed above the text accompanied by the grade for that recommendation. All the members of the Guideline Committee submitted a written record of possible conflicts of interest to the Standards of Care Committee of the BTS. IMB-L, BH, RAP and NJS are involved with the Children's Home Oxygen Record Database (CHORD) which has received funding from British Lung Foundation and Carburos Metallicos, the research arm of Air Products (based in Spain). These are available for inspection on request from the Chairman of this Committee. Funding for the literature search and travel to the guideline meeting was kindly provided by the British Thoracic Society. The authors thank Lisa Stirk at the Centre for Reviews and Dissemination at the University of York for the literature search; Professor Fenella Kirkham, Paediatric Neurologist at the Institute of Child Health, London for advice on sickle cell disease; Dr Gerry Coghlan, Consultant Cardiologist at the Royal Free Hospital, London for his comments on pulmonary hypertension; and Dr Renee McCulloch, Consultant in Palliative Care at Great Ormond Street Hospital, London for comments on palliative care. The following acted as specialist reviewers: Clinical Associate Professor Dominic Fitzgerald, Paediatric Respiratory Medicine, Children’s Hospital, Westmead, Sydney; Professor Sheila G Haworth, Professor of Developmental Cardiology, Institute of Child Health, London; Dr Jeremy Hull, Consultant in Paediatric Respiratory Medicine, Oxford Children’s Hospital; Professor Neena Modi, Professor of Neonatal Medicine, Imperial College London and Honorary Consultant, Chelsea and Westminster NHS Foundation Trust; Dr Win Tin, Consultant Paediatrician and Neonatologist, James Cook University Hospital, Middlesbrough; Dr Jane Williams, Nottingham University College Hospital NHS Trust on behalf of the British Academy of Childhood Disability. The authors also thank the Quality of Practice Committee of the Royal College of Paediatrics and Child Health for reviewing the guidelines. Oximeters from different manufacturers may give different oxygen saturation readings depending on whether fractional or functional oxygen saturation is being measured. The median baseline saturation in healthy term infants during the first year of life is 97–98%. In only 5% of healthy infants is the arterial oxygen saturation measured by pulse oximetry (Spo2) <90% for >4% of the time. The median baseline Spo2 in healthy children ⩾1 year old is 98% with a 5th centile of 96–97%. A healthy child aged 5–11 years spends no more than 5% of the time below a Spo2 of 94% while asleep. Hypoxaemia causes pulmonary hypertension but the precise severity and duration of hypoxaemia needed to do this are not known. The factors affecting individual susceptibility are also unknown. Spo2 levels >94–95% appear to reduce pulmonary hypertension, while levels <88–90% may cause pulmonary hypertension. This does not apply to children with congenital cardiac defects and idiopathic pulmonary arterial hypertension. Hypoxia may have adverse effects on cognition and behaviour at Spo2 levels of ⩽85%, but the effects of milder hypoxia are less clear. In infants with chronic neonatal lung disease (CNLD), Spo2 <90% is associated with an increased risk of apparent life-threatening events while Spo2 ⩾93% is not. In infants with CNLD, Spo2 <92% may be associated with suboptimal growth. In infants with CNLD, Spo2 ⩽90% impairs sleep quality but Spo2 >93% does not. There is no need to regularly assess CO2 levels in infants with CNLD who are at home [✓], but it may be useful in some neonates with other conditions [✓] and older children [C], especially when initiating home oxygen therapy. Long-term oxygen therapy (LTOT) pathway for an infant with chronic neonatal lung disease. SpO2, oxygen saturation measured by pulse oximetry. Although domiciliary refers to the home, in the context of oxygen therapy it refers to delivery of supplemental oxygen outside the hospital as it may also be used outside the home, especially by children. Modes of delivery fall into several categories (fig 2). Modes of home oxygen. Long-term oxygen therapy (LTOT) is the provision of oxygen for continuous use at home for patients with chronic hypoxaemia. It may be required 24 hours per day (continuous LTOT) or during periods of sleep only (sleep-related LTOT). The latter may be given at night alone (nocturnal LTOT) or, in young children, for daytime naps as well. Portable oxygen therapy is the provision of oxygen to deliver LTOT outside the home; when carried by the patient it is known as ambulatory oxygen therapy. Intermittent oxygen therapy is a less common situation whereby the child receives oxygen in an episodic manner but, because of the recurrent nature of the underlying condition, oxygen needs to be permanently available in the child’s home. Intermittent oxygen use may last days or weeks (intermittent LTOT), or it could be used during an acute emergency situation only (intermittent emergency oxygen therapy). Long-term oxygen therapy (LTOT) is defined as the provision of oxygen for continuous use at home for patients with chronic hypoxaemia (due to any cause) in order to maintain target oxygen saturations. It may be required 24 h per day (continuous LTOT) or during periods of sleep only (sleep-related LTOT). The latter may be given at night alone (nocturnal LTOT) or, in young children, for daytime naps as well. Portable oxygen therapy is LTOT outside the home (or in the garden). It refers to the provision of oxygen that can be wheeled on a trolley or pram, worn in a backpack or carried. When carried by the patient it is termed ambulatory oxygen. All children on LTOT require facilities for portable oxygen unless they only use it at night. There are no situations where a child receives portable oxygen that is not part of an LTOT regimen. Children are rarely housebound, and it is important to enable them (and their parents) to go outside the home in order to lead as normal a family life as possible. Intermittent oxygen therapy describes a less common situation whereby the child receives oxygen in an episodic manner but, because of the recurrent nature of the underlying condition, oxygen needs to be permanently available in the child’s home. An example would be a child with neurodisability who requires oxygen for aspiration pneumonia being treated at home (section 4.1), and who usually receives it for 1–2 weeks every few months. This is known as intermittent LTOT. In another situation an acutely hypoxaemic child may receive oxygen for a short while for an emergency situation at home, for example,. life-threatening asthma waiting for an ambulance (section 4.2). This is known as intermittent emergency oxygen therapy. Hypoxaemia refers to low oxygen tension or partial pressure in the blood. Hypoxia is less specific and refers to lack of oxygen in a particular compartment (eg, alveolar or tissue hypoxia). It is usually as a result of hypoxaemia (hypoxaemic hypoxia), decreased tissue blood flow (stagnant hypoxia), anaemia (anaemic hypoxia) or an inability of the tissues to utilise oxygen (histotoxic hypoxia). 2.2 What differences are there between adult and paediatric practice? Diagnosis. The range of conditions seen in children is quite distinct from adults. There is a tendency for children’s diseases to improve with time, whereas with adults they tend to deteriorate. Exceptions in children include cystic fibrosis and neuromuscular disease. Ordering oxygen. In children almost all oxygen therapy is prescribed by hospital specialists (consultant paediatricians) rather than in primary care. Assessment. In children, almost all oxygen assessments are done by pulse oximetry and not arterial blood sampling. Growth and neurodevelopment. These are important considerations in children. Equipment. Specific equipment is required to allow for low oxygen flows. Almost all children receiving LTOT also require portable oxygen therapy (they are rarely housebound). Many older children have LTOT for <15 h per day. Care and safety considerations. All children require supervision from a parent/carer. Preschool/school. Provision of oxygen may be necessary at nursery or school. 2.3 What is current UK practice in prescribing home oxygen? Data are available from the BTS Home Oxygen Database which receives anonymised data for England and Wales from the four oxygen suppliers; and also from the Children’s Home Oxygen Record Database (CHORD) which receives copies of the Home Oxygen Order Form once the parents have signed consent. In June 2007 there were 3136 children under 17 years of age in England and Wales receiving home oxygen, which represents 4% of all patients (adult and children) receiving it.1 From CHORD incidence data (available December 2008) on 828 children, the commonest underlying diagnoses are chronic neonatal lung disease (60%), neurodisability (7%), paediatric cardiac disease (5%), neuromuscular disease (3%) and interstitial lung disease (2%). 2.4 What is the normal oxygen saturation in a healthy infant aged <1 year and a healthy child aged ⩾1 year? Normal oxygen saturation (Sao2) is an oversimplification of a complex measurement. Assessment of Spo2 (oxygen saturation measured by pulse oximetry) can be made in different behavioural states and using different machines. An oximeter which measures fractional oxygen saturation (eg, Ohmeda 3470) may read 1.6% lower than one measuring functional saturation (eg, Nellcor N3000).2 Fractional saturation refers to the ratio of oxyhaemoglobin to all haemoglobin measured including dyshaemoglobins (eg, carboxyhaemoglobin or methaemoglobin), whereas functional saturation refers to the ratio of oxyhaemoglobin to all haemoglobin that is capable of carrying oxygen. The normal values from published data can be confusing as they may be derived from data which averages the summary data generated from a number of subjects where each recording generates its own mean, median and centiles. Thus, reference values might refer to the median of mean oxygen levels or even the 5th centile for 5th centile oxygen levels. Generation of the lower limit of normal is complicated by the fact that data are often given as mean and standard deviation (SD), but Spo2 is not normally distributed which means that the SD cannot be used reliably to generate lower 95% confidence intervals for a population. Many studies generating reference values are particularly focused on desaturation episodes, and baseline levels may be selected from periods of normal breathing. Concerning children on home oxygen, the main purpose is to maintain a stable baseline level of oxygenation, and it has been recommended that assessments should be made of summary data on a recording. Thus, the most relevant studies are those which include all data from different behavioural states and give summary data to allow the generation of lower limits of normal values. Artefact rejection is addressed by some studies, usually by visual inspection of the waveform or by disparity between oximeter heart rate and ECG. In more recent studies, automated artefact rejection by commercial monitors is more usual. Studies have been included for this section if they were of healthy children and where summary data were available for mean, median or distributions of values for Spo2. Studies which were restricted to desaturation indices or other measures of episodic desaturation were not included without the above measures. In all, 20 studies were relevant for normative values, 14 in infants and 6 in older children. Seven of the 14 studies in infants are from the same group of investigators. In only 5% of healthy infants is the Spo2 <90% for >4% of the time. There are two longitudinal studies of infants in the first 6–12 months.3 4 Masters et al4 found a slight increase in baseline levels with age but, in contrast, Hunt et al3 found no change in baseline with age but a decrease in variability. The five infant studies from the Stoke group5–9 used a modified oximeter, operating in a beat-to-beat mode (not available for clinical use), and restricted analyses of oxygen baselines to periods of regular breathing (table 1). This makes their data difficult to apply to studies in clinical practice using averaging oximeters, and where all data are included irrespective of breathing pattern. In turn, this makes comparison of clinical studies difficult when they use different oximeters and different averaging, thus including pauses, sighs and periodic breathing to different degrees. The median oxygen baseline in these studies ranged from 97.6% to 99.8% with a 5th centile ranging from 91.9% to 95.5%. Three of the studies were on infants born prematurely and without significant lung disease when ready for discharge at term, and the results were similar to those in healthy term infants. One paper11 looked at normal values in healthy preterm infants prior to term, reporting median values of 97%, measuring fractional saturation. The remaining four studies12–15 were of healthy term infants, using either short-term or overnight monitoring with different monitors. Median Spo2 levels ranged from 97% to 98.2%. Studies in this age group were all confined to sleep recordings or recordings done while in bed. One of the six studies used a beat-to-beat oximeter and analysed only regular breathing periods; this found median values of 99.5% with a 5th centile of 96.6%.10 Another study, measuring fractional saturation, gave only median figures for the 5th centile of Spo2, which was 96% with a 1st centile of 95%.16 Three more studies gave only mean data, ranging from 97% to 97.8%.17–19 The most definitive study in this area is that of Urschitz et al,20 which is a carefully validated study setting out to generate normal values for primary school children. The median value in this study is 98%, with a 5th centile of 97% and range 94–100%. However, this study also gives the 5th and 2.5th centiles for the value below which the subjects spent 5% and 10% of the recording (SAT5 and SAT10). These are particularly useful for assessment of normal oxygenation and were 95% and 94% for SAT5 and 96% and 94% for SAT10. 2.5 What are the consequences of chronic low oxygen saturation in children? Hypoxia may have adverse effects on cognition and behaviour at Spo2 levels of ⩽85%, but the effects of less severe hypoxia are less clear. A systematic review of the cognitive effects of chronic hypoxia in children was conducted in 2004.30 The evidence came almost exclusively from studies of sleep-related breathing disorders and from cyanotic heart disease in children. The conclusion was that there was strong evidence for adverse cognitive and behavioural effects of hypoxia. A subsequent re-analysis of a community-based study of nocturnal oximetry in 995 primary school children found that mildly abnormal nadirs of Spo2 (91–93%) were associated with worse academic performance in mathematics, although this effect was not significant when habitual snoring was excluded.31 There are problems with the extrapolation of these conclusions to children with lung disease. Sleep-related breathing disorders may cause neuropsychological effects from sleep fragmentation or deprivation as well as from hypoxia, and the mean saturation of the children with cyanotic heart disease in the studies cited was 85%, which may be lower than that to which pulmonary patients are exposed. The Benefits of Oxygen Saturation Targeting (BOOST) study, which compared target Spo2 levels of 91–94% vs 95–98%, did not find any differences in developmental status at 1 year, although this does not exclude more subtle later effects on cognition.32 See also section 3.1.4. In infants with CNLD, Spo2 <90% is associated with an increased risk of an apparent life-threatening event while Spo2 ⩾93% is not. In both term33 and preterm infants,34 reduced fraction of inspired oxygen (Fio2) may lead to an increase in periodic breathing, hypoventilation and central apnoeas, thus hypoxaemia may predispose to apparent life-threatening events (ALTEs). When a group of infants with chronic lung disease was kept at a higher Spo2 (94–96%), they experienced fewer desaturations to <80% compared with when their baseline Spo2 was maintained at 87–91%.35 Baseline hypoxaemia (<95%) was found in 25% of 91 preterm infants who had suffered ALTE/cyanotic episodes, and abnormal hypoxaemic episodes were found in 40%.36 In a small study of 10 infants with bronchopulmonary dysplasia (BPD) who had recently stopped supplemental oxygen (within 7 days), their mean Spo2 was significantly lower and they had significantly more central apnoeas compared with 10 healthy preterm babies.37 When the Spo2 was improved with supplemental oxygen, both central apnoea and periodic breathing densities declined.37 A cohort study of 78 infants with CNLD on home oxygen (target Spo2 93–97%) and 78 matched preterm controls found no difference in the incidence of ALTEs in the two groups (8.9% and 10.5%), and no sudden infant deaths in either group.38 These figures were felt to compare favourably with historical controls from other authors. Two observational case series have found normal growth along centiles in babies with CNLD where saturations were maintained at or above 92%39 or 93%.40 In both studies, weight gain faltered if supplemental oxygen was discontinued prematurely. In one of the studies, faltering growth was seen at a Spo2 of 88–91%.39 The BOOST study did not find any advantage in growth at a corrected age of 12 months in those whose Spo levels had been maintained at 95–98% compared with 91–94%.32 See also section 3.1.3. 2.6 What are the consequences of excess oxygen therapy in children? For a variety of conditions, we have assessed the evidence (accepting it is often lacking) as to whether supplemental oxygen is beneficial to patients and home oxygen is preferable to hospital-based oxygen. Benefit is considered in terms of survival, symptoms (breathlessness, respiratory distress, exercise tolerance), growth and neurodevelopment, school attendance and hospitalisation rates, quality of life and psychological impact. Obviously these parameters are not applicable to all patient groups. For the purposes of these guidelines, the diagnosis of CNLD is defined as an infant requiring supplemental oxygen at a corrected age of 36 weeks gestation who is at least 28 days old. It is suggested that supplemental home oxygen improves growth in infants with CNLD when the saturations are kept above 92%.40 58 59 Also eliminating sleep-associated hypoxia improves growth in infants with CNLD.39 60 See also section 2.5.4. Nevertheless, supplementary oxygen is likely to be beneficial for neurodevelopment.63 Although early assessment at 1 and 2 years of age show lower developmental scores in infants with CNLD discharged home on oxygen, by 4 years and above their development did not differ significantly from controls.62 This was despite severity of illness, duration of oxygen therapy and feeding problems often being greater among those sent home on oxygen.62 However, in this paper, 7.5% of the BPD group were excluded from the study due to “disability” compared with 4.4% of the non-BPD group; children in the non-BPD group also had a higher mean birth weight and gestational age than the two groups of children with BPD. See also section 2.5.2. Other relevant neonatal lung conditions include pulmonary hypoplasia, congenital pneumonia and meconium aspiration syndrome but, compared with CNLD, these cases are rare. Survivors of congenital diaphragmatic hernia repair not uncommonly develop chronic lung disease, mainly due to pulmonary hypoplasia or lung damage resulting from mechanical ventilation. Some require home oxygen but this is rarely necessary beyond 2 years of age.79 Randomised controlled trials have not been (nor could be) conducted, hence the low-level recommendation. Nevertheless, it is likely that outcomes from receiving LTOT at home would be no different from those for infants with CNLD. Excluding pulmonary hypertension (see below), cyanosis in congenital heart disease is produced by decreased pulmonary blood flow or decreased effective pulmonary blood flow resulting from a parallel circulation (eg, transposition of the great arteries) or pulmonary and systemic venous admixture. In either situation, oxygen has little effect in elevating Sao2 so is not indicated, although the degree of polycythaemia may be reduced.80 Home oxygen is therefore rarely recommended for cyanotic congenital heart disease unless accompanied by other respiratory problems. Oxygen may be required in the presence of ventilation/perfusion mismatch due to acute pulmonary oedema. This could be caused by pulmonary venous hypertension (left heart failure or left heart obstructive lesions) or because of a large left to right shunt. However, it is likely that children with acute pulmonary oedema will be hospitalised, so home oxygen has no place in the management of acyanotic heart disease. In patients with pulmonary hypertension associated with congenital cardiac defects, hypoxaemia is related to reversal of left to right shunting (Eisenmenger syndrome) and is refractory to supplemental oxygen. Clinical experience, however, shows some children with Eisenmenger syndrome subjectively feel better on nocturnal oxygen. There is a report of a single case of successful treatment for postoperative pulmonary hypertension using continuous oxygen81 but, in general, the repair of cardiac defects in the presence of significant pulmonary vascular disease leads to a reduced life expectancy. There are, however, many pharmacological ways to manage pulmonary hypertension. In a small non-randomised open study of children with pulmonary vascular disease who were unsuitable for corrective surgery, 100% oxygen was given during cardiac catheterisation to assess oxygen responsiveness.82 Some of the children were then given a variable amount of oxygen at home for a minimum of 12 h per day for up to 5 years. They found that survival was imprpoved compared with those not having supplemental oxygen, but there were numerous methodological problems with the study including likely selection bias and non-equality in the two groups. In addition, a more recent 2-year study of adults with advanced Eisenmenger syndrome showed no benefit from nocturnal oxygen in terms of survival, exercise capacity or quality of life.83 In end stage pulmonary hypertension, children with severe right ventricular failure and resting hypoxaemia due to markedly increased oxygen extraction may need LTOT for symptomatic relief. Intrapulmonary shunting (most commonly via arteriovenous malformations) is a cause of low Sao2.86 Multiple small lesions are not amenable to embolisation. As alveolar oxygen levels are not affected, the impact on the pulmonary vasculature is likely to be less than when due to other pulmonary causes of a low Sao2 with impairment of gas transfer. However, the impact of chronic arterial desaturation on other systems is unknown. Whereas right to left shunting at a cardiac level is rarely supported with LTOT, some children with multiple small arteriovenous pulmonary malformations receive oxygen therapy to increase the arterial saturation. The possibility of a benefit to neurological development has been raised.30 Subjectively, some children benefit symptomatically with improved daytime activity. An uncommon indication for home oxygen therapy is its use in infants and children who have recurrent cyanotic-apnoeic episodes severe enough to require cardiopulmonary resuscitation. Such episodes may manifest as persistent apnoea of prematurity87 or severe cyanotic breath holding.88 These conditions have a well established association with anaemia but, where treatment of this fails, continuous administration of oxygen has been reported to help.36 89 Additionally, such episodes may be a manifestation of brainstem disorders (eg, Arnold-Chiari malformation) or peripheral airway abnormalities (eg, severe tracheobronchomalacia). Oxygen may also be supplied for acute intermittent use in this group of children to aid recovery during and after an event but, as with seizures (section 4.2.2), the priority remains lung inflation and ventilation. Interstitial lung disease represents a spectrum of rare conditions with a variable, but often poor, outlook (eg, chronic pneumonitis of infancy, non-specific interstitial pneumonitis, desquamative interstitial pneumonitis, immunodeficiency) in which oxygen exchange is impaired. Drug therapy (usually systemic corticosteroids and/or hydroxychloroquine) is sometimes beneficial. Many of the children are hypoxaemic and require LTOT. The European Respiratory Society task force on chronic interstitial lung disease reported that 26% of all children with interstitial lung disease were on long-term oxygen, and 55% of those under 2 years of age.90 There has been a single unpublished adult study (reported in Cochrane review) which found that domiciliary oxygen had no effect on mortality after 3 years.91 A sufficiently powered randomised controlled trial of domiciliary oxygen for children with these rare disorders can never be conducted, hence the low level of evidence-based recommendation. Nevertheless, in reality the recommendation is to offer it. As tretament improves, there are fewer children with cystic fibrosis (CF) who are hypoxic and require supplemental oxygen, and pulmonary hypertension is uncommon in children with CF. Hypoxaemia may be associated with infective chest exacerbations when ventilation-perfusion mismatch is worsened. It has been estimated that 1–2% of children with CF receive LTOT,94 and a recent questionnaire survey answered by 57 paediatric CF units in the UK revealed that 1.9% of children receive LTOT.95 There is, however, little evidence to guide when supplemental oxygen is indicated in CF,96 nor when children should be screened for nocturnal hypoxaemia. Oxygenation problems are not limited to those with severe disease; a study of 24 children (median age 9.5 years) showed that 96% of children with normal lung function or mild to moderate lung disease (defined as percentage predicted forced expiratory volume in 1 s of 40–60% and 60–80%, respectively) had desaturation events during sleep, although they would not be classified as having nocturnal hypoxia (Spo2 <90% for >5% time).97 There was a degree of correlation of nocturnal oxygenation with clinical, radiographic and growth parameters. Although the proportion of children with CF having desaturations was similar to a study of normal children,20 the children with CF had a lower mean and minimum Spo2 and more desaturation events. There is surprisingly little evidence for the benefit of LTOT in CF and, while in one small randomised study (n = 28) it led to an improvement in school or work attendances, there was no effect on mortality rate, frequency of hospitalisation or disease progression.98 One problem with that study was that nocturnal oxygen was titrated to normalise daytime Spo2, which is not necessarily predictive of nocturnal hypoxaemia, so some of the patients may have been undertreated. It is not clear how many of the subjects were children, although all were over 12 years of age; three of the four recruiting hospitals were children’s CF units. It is recommended that LTOT is reserved for those patients with CF who obtain symptomatic relief,99 particularly as adherence to treatment is usually poor if the child feels no benefit. The potential adverse psychological effect of starting oxygen at home must also be considered. It is often taken as an indicator of a serious deterioration in the child’s condition and has rightly been described as an “emotional life event” for a patient with CF.100 It is yet another burden of treatment, so the patient and family must be motivated and convinced of the need. In two small studies of adults comparing non-invasive ventilation with supplemental oxygen, it was noted that, in those receiving supplemental oxygen alone, the improvement in oxygenation was accompanied by a rise in transcutaneous CO2, which caused morning headaches in a few patients.101 102 Studies have not been carried out in children, but there is no reason to suggest this would be different in adolescents with severe lung disease who are the ones likely to be receiving home oxygen. It is therefore recommended that monitoring of transcutaneous or capillary CO2 levels should be carried out when oxygen therapy is initiated. In the presence of significant hypercapnia, non-invasive ventilation may need to be considered rather than oxygen supplementation alone. Humidification is recommended in CF (section 6.2.6). A Cochrane systematic review has summarised the effects of supplemental oxygen on exercise from three studies (that included a few children only); there was an improvement in exercise duration and peak performance.103 In reality, use of supplemental oxygen for exercise would not be an indication for domiciliary oxygen in children with CF. There are other causes of bronchiectasis in children (although in approximately 50% of cases no underlying cause is found), and occasionally LTOT is necessary for those with severe disease. Obstructive sleep apnoea syndrome may require continuous positive airway pressure (CPAP) or occasionally non-invasive ventilation (NIV) if the obstruction cannot be relieved surgically. Occasionally supplemental oxygen alone is used if the (young) child does not tolerate face mask ventilation, usually because of behavioural problems often combined with developmental delay. There are two studies on the effects of oxygen supplementation on obstructive sleep apnoea in children.104 105 Both were short term and found benefits in the mean and the nadir Spo2. Oxygen does not suppress the ventilatory drive in the majority of children but, in one study, 2/23 subjects had increased end-tidal CO2 during supplementation.105 There is no evidence concerning longer term benefits. It is important that children with sickle cell disease and upper airway obstruction do not become hypoxaemic during sleep, as it can lead to debilitating episodes of sickling.109 Low mean overnight Spo2 has been linked to both cerebrovascular disease (strokes, transient ischaemic attacks, seizures)110 and frequent episodes of acute pain.111 Clearly nocturnal hypoxaemia occurs, and in one study of 53 children with sickle cell disease of median age 7.8 years, 16% desaturated to below 80% and/or had low baseline Spo2 during sleep.112 Thirty-six percent had sleep-related upper airway obstruction and, although adenotonsillectomy relieved the symptoms and episodic hypoxaemia, it did not normalise low baseline Spo2. In a recent study of 75 children aged over 6 years, the prevalence of raised pulmonary artery pressure was 30%, which was similar to adults.113 This was significantly associated with a low Spo2 documented in clinic. Since pulmonary hypertension confers a high risk of death in sickle cell disease (at least in adults),114 chronic hypoxaemia must be prevented. The mechanism of desaturation is not fully understood. Many children with sickle cell disease and low daytime or night-time Sao2 will have no evidence of parenchymal lung disease or obstructive sleep apnoea. In these children, the low Sao2 appear to be a combination of a right-shifted oxygen saturation curve (because of sickle haemoglobin (Hb)) and increased levels of carboxyhaemoglobin and methaemoglobin, leading to lower saturations with normal or near-normal oxygen partial pressures. It seems likely that the low oxygen Hb saturation combined with a low Hb (often around 6–8 g/dl) can lead to true tissue hypoxia with a consequent increased risk of sickling, micro-circulation occlusion and ischaemia. Increasing the Fio2 with low flow oxygen readily increases the saturation to 98% or more. This is a special situation whereby a child receives continuous LTOT in an episodic manner, usually for 1–2 weeks every few months. Because of the recurrent nature of the condition, oxygen is permanently available in the child’s home. Neurodisability is the second most common reason for prescribing long-term home oxygen, but the reasons for this prescribing are unclear. In part, the heterogeneity of clinical conditions encompassed by the term “neurodisability” contributes to this difficulty. The issue of oxygen administered for status epilepticus is outlined below in the section on intermittent emergency oxygen therapy (section 4.2.2). Respiratory problems are recognised as the most common factor in the mortality of children with severe cerebral palsy.123 Lower respiratory tract infections (LRTI) in children with severe neurodisability are often associated with aspiration secondary to gastro-oesophageal reflux or direct aspiration due to oropharyngeal motor problems.124 Other factors contributing to recurrent LRTIs include scoliosis, ineffective cough and weakened respiratory effort due to malnutrition. Positioning, suction, physiotherapy, antibiotics, bronchodilators and, if necessary, gastrostomy feeding with fundoplication are all used to prevent or treat aspiration pneumonia. In children with pneumonia, hypoxia can be corrected by supplemental oxygen and should be given if the Spo2 is <92%.125 While oxygen should be used for the acute situation, this will often be given in hospital. However, some families will try and treat these children at home and, if the infections are recurrent, LTOT may be indicated. In these cases, among other issues, the risk of hypercapnia should be considered. Supervision by the community team is recommended. There are some children with CF (section 3.8) who only require their LTOT when they are having a chest exacerbation due to infection or bronchospasm. Also, some children with pulmonary hypertension (section 3.4) only have significant desaturations when they have viral upper respiratory tract infections, so only need LTOT intermittently. This is another special (and exceptional) situation whereby an acutely hypoxaemic child receives oxygen for a short while for an emergency situation at home. Because the condition causes recurring problems, oxygen is made permanently available in the child’s home. Any child with an acute asthma episode severe enough to require oxygen (indicated by Spo2 <92%) should be in hospital and not at home.126 There are, however, a few children who have such severe asthma that they need supplemental oxygen while waiting for an ambulance to take them to hospital, so it must be available at home.127 Generally, spacer devices are preferred for administering bronchodilators,128 but there are occasions when the child is only able to use a nebuliser. Home nebulisers are usually driven by room air, but nebulised salbutamol can cause an initial fall in Spo2 in children with asthma and infants with wheeze, more commonly with air-driven rather than oxygen-driven nebulisation.129 130 Salbutamol can cause pulmonary vasodilation and increased cardiac output, which worsens ventilation-perfusion mismatch.131 This may be clinically significant if the child is already hypoxaemic and on the steep part of the oxygen dissociation curve due to acute bronchoconstriction. There has been a brief report of a child who died in a primary care setting after receiving salbutamol nebulised with air, although details are not given.132 Although high flow oxygen may be used to drive the nebuliser while waiting for the ambulance, it may be better to use the nebuliser with room air and deliver oxygen simultaneously via nasal cannulae. Convulsive status epilepticus is a common medical emergency associated with morbidity and mortality. The outcome is determined by the length and underlying cause of the seizure.137 Hypoxia usually occurs as a direct result of the seizure, so stopping it quickly is critical. In a study of 101 seizures in 37 children, apnoea was documented in 30% of focal seizures (12/40 monitored seizures).138 Half showed episodes of tachypnoea and 25% showed “bradypnoea” (defined in this study a decrease in respiratory rate of >10% from the pre-ictal baseline). The combination of bradypnoea and hypoxia (based on saturation studies) were only seen in those children with focal seizures (with or without secondary generalisation). Their cut-off for “significant hypoxia” was, however, 85%, and it remains possible that milder desaturations occurred. There were no significant respiratory changes in the “absence seizure” group. The authors speculate that most of the respiratory abnormalities in this study were centrally driven. There is a specific group of children with focal seizures who experience slower respiratory rates and desaturations but no frank apnoeas. There is no evidence to support or refute the anecdotal reports that supplementary oxygen can reduce seizure duration in this group. Another study demonstrated hypoxaemia in 42/53 seizures in 10 children.139 In 85% of these seizures there were apnoeic pauses, but in only 78% of those was there accompanying hypoxaemia. In cases where the hypoxia is secondary to apnoea (usually as a primary manifestation of focal seizures) or due to secondary mechanical obstruction (secretions/vomit/tongue), there is neither any reason nor any evidence to suggest supplementary oxygen will be of help. Nevertheless, some clinicians advocate giving oxygen to children having recurrent severe seizures with cyanosis/apnoeas, especially if there is a history of previous cardiopulmonary resuscitation or mechanical ventilation. Face mask oxygen is occasionally used in the hospital setting, however, as part of an attempt to reduce the hypoxia caused by respiratory depression secondary to the medications used to terminate the seizures (the rate of respiratory depression following administration of benzodiazepines is 10–20%). The important priorities in infants and children who have cardiorespiratory effects as an early visible manifestation of their seizures are to ensure airway positioning and clearance and, if needed, basic life support to include lung inflations with or without cardiac compressions. While oxygen may be of limited help, it is important to ensure that satisfactory ventilation is occurring while an ambulance is called and during transfer to hospital. Administration of oxygen should not detract from the more useful aid that can be given to the child. However, there has since been a randomised trial of 92 infants aged 2–24 months presenting with acute bronchiolitis and hypoxia, defined as Spo2 ⩽87%.145 After excluding those with serious complications, 70% of those randomised for discharge with home oxygen could be discharged after an 8 h observation period (some no longer required oxygen and some failed to meet the discharge criteria). Of those sent home, 97% were treated successfully with 1 l/min oxygen via nasal cannulae as outpatients; however, one child had to be admitted after a cyanotic spell that occurred after 24 h at home. This certainly opens up a potential alternative to hospital admission but, if financial considerations were excluded, it is likely that most parents would opt for a short hospital stay. In addition, it must be remembered that these patients presumably had the US definition of bronchiolitis (it is not defined in the paper), and some of them would have been diagnosed as acute viral wheeze or infantile asthma outside the USA. 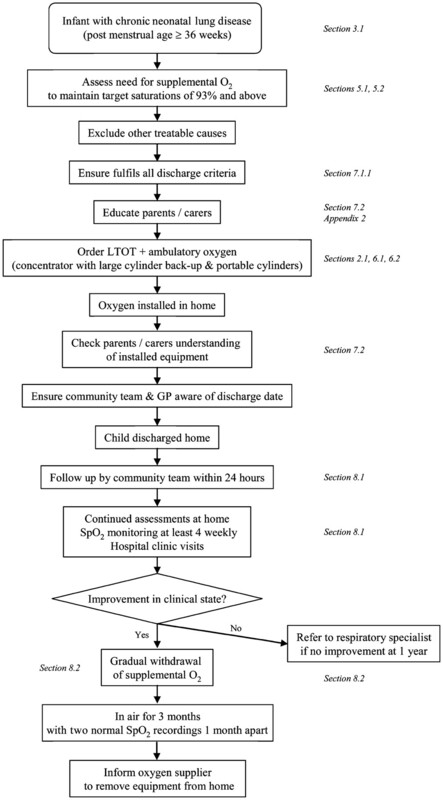 A randomised controlled Australian pilot study has looked at whether children with acute bronchiolitis still requiring supplemental oxygen 24 h after admission could be sent home on oxygen with nursing support (twice daily visits plus a phone call).146 They were only allowed home if they passed a “safety in air” test, meaning their Spo2 remained ⩾80% after 20 min in air. There were 44 children aged 3–24 months. It was found that those sent home on oxygen spent almost 2 days less in hospital than those who went home once they were in room air. No extra complications occurred, with one readmission in each group (one with bacterial pneumonia, one with dehydration due to gastroenteritis). The main difference from the US study is that the children were all admitted for 24 h before having home oxygen, which seems a safer option. Although home oxygen saved hospital days, the community nursing support that would be required during a bronchiolitis season would be quite considerable. Suitability for home oxygen therapy should be assessed by a specialist with appropriate experience in the care of the relevant condition; this is usually either a respiratory paediatrician or neonatologist (but may be a paediatric cardiologist, general paediatrician, neurodisability paediatrician or palliative care specialist). The family must also be assessed as competent to manage home oxygen therapy and be able to cope with all aspects of the infant’s care. Spo2 should be measured by pulse oximetry in infants.94 Arterial stab measurements are often unreliable because of the distress associated with the procedure, and capillary measurements of Pao2 do not correlate with simultaneous arterial values of Sao2.147 Saturations should be assessed using an appropriate-sized probe and an oximeter with which the supervising clinician is familiar. Some oximeters may systematically under- or over-read by 1–2% compared with other apparently similar machines;2 148 the issue of pulse oximetry methodology has been discussed in section 2.4.1. Measurements should be made over at least 6–12 h and in various states of activity including a period of sleep and feeding.94 Spo2 should remain at the target level (see below) for 95% of any stable recording period. The infants tend to be measured lying on their backs, or sometimes sleeping on their sides. There is no evidence to support the use of monitors recording CO2 or breathing pattern as part of the routine assessment in neonates with CNLD (they will have had their CO2 monitored regularly in the neonatal unit). There are some neonates with hypoventilation (eg, neuromuscular disorders) or upper airway obstruction where CO2 monitoring is necessary. In older children, transcutaneous or end-tidal CO2 may be useful, especially in those with sleep-disordered breathing,105 chronic hypoventilation108 and CF101 102 (see relevant sections), and particularly at initiation of home oxygen. 5.2 What is the target Spo2 level to avoid the adverse consequences of hypoxaemia? There can be no recommendation for a target oxygen level for pulmonary arterial hypertension associated with congenital heart disease. Based on limited evidence from studies with adult COPD, patients with idiopathic pulmonary hypertension should be given oxygen for at least 15 h per day to maintain a Pao2 of >8kPa,152 although this is not necessarily applicable to children. Equally, there are no data to guide target levels for Spo2 in older children with other conditions. However, the recommendation is to maintain Spo2 at ⩾93%, although ⩾90% may be more appropriate for CF (section 3.8) and ⩾94% for sickle cell disease (section 3.11). 5.3 Should the right heart be assessed? England is split into 10 oxygen regions and, together with Wales, the 11 regions are supplied by three companies: Air Products, Air Liquide and Linde/British Oxygen Company (BOC). Details for each region are available on the NHS home oxygen website (www.homeoxygen.nhs.uk). The companies are contacted by the prescriber who, after gaining parental consent, faxes details on a Home Oxygen Order Form (HOOF). It is planned that soon this will be sent electronically (eHOOF). Further details and useful practical information for prescribing home oxygen are available on the British Paediatric Respiratory Society website (www.bprs.co.uk/oxygen.html). In Scotland, oxygen concentrators are provided on prescription by named consultants in respiratory medicine via Health Facilities Scotland, details of which can be found at http://www.shs.scot.nhs.uk/oxycon/oxygen.html. This is a national service coordinated and funded by National Services Scotland who subcontract the service to R L Dolby to install and maintain concentrators. Prescribing is generally done by completing an SHS/OXY 1 form or by completing a “BabyOx” form. These can be obtained from the Oxygen Therapy Service on request. All patients prescribed home oxygen will be provided with a back-up cylinder. It is assumed that patient consent has already been obtained before requests for supply are made. Standard domiciliary cylinders and portable oxygen cylinders are provided through GPs and community pharmacies and are capable of providing flow rates of 2 or 4 l/min. Other flows are available via the Oxygen Therapy Service. In Northern Ireland, oxygen assessment is primarily undertaken in secondary and tertiary care and oxygen concentrators and cylinders must be prescribed by GPs using form HS21. Oxygen concentrators are supplied by one company (Air Liquide). Cylinders and accessories are available from pharmacists, supplied by two companies British Oxygen Company (BOC) and Air Products (chosen at the discretion of the pharmacist). 6.2 Which delivery system is the best for children? There is no evidence available to support whether an oxygen concentrator or cylinder is best for use in children. Oxygen concentrators are usually the preferred devices with large back-up cylinders for breakdown or power cuts. They work by filtering room air and removing the nitrogen to increase the oxygen concentration so that purified oxygen with a concentration of up to 95% can be delivered to the patient. There are several types available, and the flow can be set at 1–4 l/min; there is also a low flow concentrator that delivers 0.1–1.0 l/min. Oxygen concentrators need two outlets, one in the child’s bedroom and one in the main living room area. Modern concentrators are becoming more advanced and are able to deliver higher flow rates, fill portable cylinders and work off a battery, but these sophisticated concentrators are rarely supplied to the paediatric population. There are a number of small portable concentrators, some of which are quite light (4–10 kg). They are battery operated and can be charged off the mains. Some are being developed to be used at the low flows necessary for children, and eventually these may be an alternative option to cylinders for portable use. Disadvantages of oxygen concentrators are that they can be bulky (usually 50–70 cm tall), noisy (humming like a fridge) and give off heat. Oxygen cylinders may be more appropriate for LTOT if the initial flow rates are lower than 0.3 l/min and the anticipated duration of oxygen therapy is less than 3 months. Particular attention must be paid to safety and securing of large cylinders to a wall in the presence of young children. Both cylinders and concentrators should be switched off when not in use. Information on caring for the equipment is available from the suppliers. Portable cylinders are required for almost all children on LTOT (table 2). For convenience, most people prefer light weight cylinders, the difference between standard and light weight being 0.5–1.0 kg depending on the supplier (table 2). However, standard cylinders have the advantage of longer usage, so allowing a longer period out of the home; this has more of an impact at higher flow rates (table 2). The light weight cylinders can be carried in a back pack by older children. Not all cylinders deliver the full range of oxygen flows. Consideration should also be given to the type of cylinder that may be placed on a pram/buggy and parents need advice on the type to buy (ie, one with a metal basket underneath that is safe and strong enough to hold the cylinder). Children in wheelchairs need to have a cylinder fitting provided by their wheelchair service to maintain safety. There is a central reservoir (Dewar flask) that is used to refill the portable system, thus giving more autonomy to users who can do their own refills. The capacity of the cylinder is considerably more than standard gas cylinders, so this is convenient for patients staying away from home for long periods (especially if on a high flow rate). Less storage space is needed for liquid oxygen as varying delivery arrangements for normal cylinders may require the storage of several cylinders at a time. It may be an option for use at school if there are difficulties installing a concentrator or the duration of standard cylinders requires more than one cylinder per day. Currently the lowest flow rate for continuously delivered liquid oxygen is 0.25 l/min. Lower flows are available with a pulse system that is breath-activated, which is inappropriate for younger children. A liquid portable system is heavier than standard portable cylinders. There is a risk of cold burns should the system leak. Training is needed to ensure that the parents/guardians are able to safely refill the liquid oxygen system. It may not be possible to attach a holder to a wheelchair for the liquid oxygen system and it cannot be laid flat under a pram. They are expensive and there are limited supplies. Low flow meters (0.1–1 l/min) must be available for infants and very young children. Although micro (or very low) flow meters exist (0.01–0.1 l/min), allowing the flow to be reduced even further before weaning to air is usually unnecessary. There is also a concern that some carers may become confused by the decimal points. 6.2.5 Should a conserver device be used? An oxygen conserver is a battery-driven device to ensure oxygen is delivered from the cylinder only during inspiration, which prolongs the cylinder life up to threefold. A conserver is said to be usable in older children, but is generally not used in paediatric practice due to the often irregular and shallow breathing patterns. It also makes a short noise when the oxygen is released. They should only be used if it is clearly established that the child can reliably trigger the device during quiet breathing. While humidification is regularly used in hospital settings, the practicalities of providing humidified oxygen at home are more difficult. A humidification system is often required for those on flow rates above 1 l/min for nasal comfort. Cold bubble humidifiers may be used for this purpose, but they only achieve 40% relative humidity and are inadequate for direct airway humidification (eg, via a tracheostomy). Heated humidification is less convenient for domestic use, and only effective at flow rates of 4 l/min or higher delivered by a concentrator as water can block the tubing at lower flow rates. There is one supplier that can provide humidification for flows of 2–4 l/min. Humidifiers can pose logistic problems for portable use, so a heat-moisture exchanger may be needed at times. There are, however, theoretical risks of infections from humidifiers and use of bacterial filters may be necessary. 6.3 Should parents have a home saturation monitor? There is little evidence to inform this question with both advantages and disadvantages (table 3). One study which documented saturation monitors used at home in a population of children at high risk of respiratory events found that they detected events that were not otherwise clinically apparent, but which needed intervention, in 10/37 children.155 However, there were only 5 children in this group who were on home oxygen and all had complex morbidity, putting them at increased risk of airway or breathing problems. The current prevalence of sudden unexpected death in infants on home oxygen maintained at normoxaemic target levels appears to be no higher than other preterm infants and, if anything, the prevalence of ALTEs was found to be lower.38 It would therefore be difficult to argue for the increased safety of infants on home oxygen using saturation monitors. Some may be found to have apnoeas or other adverse events when inadvertently disconnected from oxygen without arousing and crying and, if this is a clinical concern, it may be felt appropriate to provide a saturation monitor. However, if a child requires continuous monitoring, it is unlikely that he/she is ready for hospital discharge. There are no data as to whether the presence of a saturation monitor facilitates weaning off oxygen; most community nurses leave a monitor in the home overnight when checking progress. In some cases, having a monitor may lead to inappropriate and frequent short-term adjustments of oxygen flows, and it may also cause unnecessary anxiety due to falsely low readings caused by movement artefact. It may also give false reassurance as Spo2 is only one aspect of the infant’s respiratory status. The American Thoracic Society 2003 statement on the care of the infant with chronic lung disease leans towards home oximetry but does not firmly recommend it.73 Their rationale seems to be mostly cost-based in terms of reducing hospital and office visits. Enough space for oxygen equipment. Clear atmosphere (ie, not smoky). No anticipated problems with electricity supply. Easy access to take infant out in pram with oxygen cylinder (including a lift in a block of flats). No other clinical conditions precluding discharge, and the child must be medically stable with satisfactory weight gain. No clinical cyanotic or apnoeic episodes in the 2 weeks before discharge. Parents are willing and felt to be capable of taking the infant home while still on oxygen. Home conditions must be satisfactory and preferably a landline telephone is installed (in addition to a mobile telephone). A visit from a member of the home care team is required before discharge (box 2). Parents must be advised about smoking cessation. Parents must be advised about travel with cylinders and inform their home and car insurers. Appropriate support must be in place (eg, community paediatrician, community nursing, nurse specialists, health visitor, social worker). Communication with the GP has taken place and the roles are clarified for delivering clinical care. Parents must have a list of telephone numbers for advice and emergency help including equipment breakdown. Arrangements are in place for open access to the local paediatric unit. The American Academy of Pediatrics recommends all infants born <37 weeks gestation should be observed with cardiorespiratory monitoring in a car seat before discharge to monitor for possible apnoea, bradycardia or oxygen desaturation; they also suggest that travel be kept to a minimum for those at risk of respiratory compromise.159 This is due to the problems of potential upper airways obstruction associated with a poor fit of a small baby in a standard car seat.160 However, not all have found that the car seat test reliably detects adverse respiratory events, and it can also produce false positive results which delays discharge.161 This issue is not specific to infants sent home in oxygen, but generally they are a group more at risk of oxygen desaturations and apnoeic episodes. Older children also need to have training on how to use their oxygen equipment. Arrangements need to be in place with the child’s nursery/school (section 9.1). 8.1 What follow-up is required? Arrangements for follow-up should be organised by the hospital consultant who has initiated the home oxygen therapy.94 Infants and children should have hospital follow-up within 4–6 weeks of discharge, and this could take place either in the tertiary centre or district general hospital if the general paediatrician has experience of home oxygen. The tertiary centre should have an agreed management plan with both the general or community paediatrician and GP. The oxygen requirement is likely to change over time; it should reduce in infants with CNLD but is likely to rise in most other conditions. If the carers believe the child requires an increase in oxygen, they can turn up the flow rate but must then seek advice from the home care team. The children should be seen regularly by the specialist to monitor the underlying condition as well as growth and neurodevelopment. There must be direct access for the child to be admitted to hospital in the case of any emergency or acute deterioration in the condition, and the parents must have the telephone numbers and 24 h access to the team. Community children’s nurses or respiratory nurse specialists are a valuable resource to provide assessment and ongoing support and education to the parents, and would ideally visit the home within 24 h of discharge for reassurance.69 The first formal Spo2 monitoring should take place within a week; subsequent recordings should occur as clinically indicated, but rarely less often than every 3–4 weeks for infants with CNLD.169 The monitoring should include various activity states including feeding; it will often take place overnight. The data downloaded from the pulse oximeter should be discussed with the designated clinician and the management plan revised accordingly. Older children who are clinically stable are likely to need home Spo2 recordings performed less often than infants with CNLD. It is difficult to assess adherence to treatment. Although it is possible to determine the number of hours an oxygen concentrator has been running, it does not mean the oxygen was delivered to the patient. If the child is supplied with oxygen cylinders, then the number of refills required will give some information. The process of oxygen withdrawal is best overseen by a children’s community nurse or a nurse specialist experienced in home oxygen therapy. Saturation monitors do not need to be left in the home except for overnight saturation studies. Monitoring oxygen withdrawal can usually be carried out at home and does not necessitate hospital admission, which has the advantages of reducing the risk of nosocomial infection, freeing hospital beds and convenience for the family. One approach to oxygen withdrawal is to gradually increase the amount of time spent in room air during the day, assuming the infant remains well and has acceptable “spot” Spo2 measured. Once in room air all day, prior to discontinuing the overnight oxygen a formal night-time saturation study should be performed and, if this is acceptable, oxygen is then discontinued. An alternative approach is to perform an overnight oxygen saturation study in air in an infant who is growing well with no respiratory problems and, if this is acceptable, to withdraw the oxygen completely. One advantage of the first approach may be that it is more acceptable to parents, who have come to depend on the oxygen, and it is easier to put the child back into oxygen if they should have an intercurrent respiratory illness causing hypoxia. Oxygen equipment is usually left in the home for a further 3 months after stopping oxygen treatment altogether (or at least until the end of winter); it is usually prudent to ensure the child has coped with at least one viral upper respiratory tract infection without problems before the equipment is removed. It is also recommended that the child has had two unequivocally normal oximetry recordings 1 month apart. It is not easy to counsel parents as to how long LTOT will be needed in children with CNLD. Although group data showed that capillary blood Paco2 measured near term correlates with length of oxygen dependency in CNLD, it is impossible to predict for an individual.190 However, in general, those with a higher Paco2 are more likely to require oxygen for longer. The length of time infants with CNLD remain on LTOT varies but is usually under 12 months, although some require it for a number of years.29 180 191 In the EPICure cohort of 308 babies born ⩽25 weeks gestation, 283 survivors were assessed at 30 months of age.162 Of these, 101 (36%) had gone home with oxygen, and the median length of oxygen requirement after 40 weeks postmenstrual age was 2.5 months with a 75th centile of 8.5 months; <3% still required oxygen at 1 year. Persisting symptoms or failure to progress warrant review to rule out concomitant conditions (box 3). The issue of portable oxygen equipment needed to allow the child outside the home has been discussed in sections 2.1 and 6.2.2. There is a small but important demand for oxygen therapy to be available in schools. Little research has been undertaken in this area, with no recommendations about oxygen use in either schools or nurseries and day care for preschool children. Oxygen therapy improved school attendance by children with chronic respiratory failure in France192 and children with CF.98 However, the CF study only looked at the effects of nocturnal oxygen rather than oxygen administered in the school. Liaison is required between the specialist paediatric respiratory team and the education health services (Local Education Authority and head teacher), and this is usually coordinated by community paediatric services. A written care plan should be available for all the child’s carers. Teachers need to have appropriate information about the child’s oxygen use and its implications for the child’s education, and others attending or working in the school (see checklist in online Appendix 2). The child may need a statement of educational needs or a coordinated support plan undertaken or updated. Additional staff and/or funding may need to be arranged at an early stage. Training should be given by an appropriately experienced health professional, usually the children’s community nurse or nurse specialist. Individuals who have undergone appropriate training can subsequently undertake the child’s care in school and be present while the child is using the oxygen. This does not necessarily have to be the school nurse or a health professional. However, school staff must have easily identified healthcare contacts and adequate technical back-up must be available. The oxygen equipment supplier (who requires a separate home oxygen order form for the school) will provide instruction in the safe use of the equipment, with appropriate information leaflets and contact details. Safety devices must be in place for stabilising oxygen cylinders or other equipment. Finally, insurance cover must be obtained by the school for staff and premises and the Local Education Authority’s risk assessment specialist may need to be involved. There are a number of publications dealing with the interface of children with health problems attending school. One document which refers to oxygen therapy in education is “Including me: managing complex health needs in schools and early years settings” (available online at http://www.ncb.org.uk/dotpdf/open_access_2/including_me.pdf). There is no legal requirement to display window stickers or a card on the dashboard when carrying medical oxygen for personal use. Many sources still recommend placing a warning green sticker in the back window, but this is incorrect. Indeed, displaying stickers may mislead emergency services if the oxygen is not in the car at the time. The UK regulations are covered by the Carriage of Dangerous Goods and Use of Transportable Pressure Equipment Regulations 2007 available online at http://www.opsi.gov.uk/si/si2007/pdf/uksi_20071573_en.pdf. Parents must advise car insurers that a small amount of oxygen for medical use is being carried in the vehicle. The cylinders must be secured safely in the boot of the car, behind the front seats or on the back seat with a secure fastening; they should not be carried in the front passenger seat. If transporting several portable cylinders, they should be carried in a green safety box, but individual portable cylinders can be kept in their carry bag. Families sometimes purchase small portable oxygen concentrators that run off a battery and can be plugged into the car’s cigarette lighter. It is suggested oxygen must not be used in a petrol station, but this is not always practical. Finally, cylinders can be taken on public transport (eg, buses and trains) as long as the cylinder is in good condition and obvious safety measures are undertaken. Oxygen can be arranged for holidays in the UK, free of charge, by the oxygen suppliers under the NHS service contract. It is imperative to plan at least 4–6 weeks ahead for this. Information is available on the NHS home oxygen website (www.homeoxygen.nhs.uk). Oxygen for holidays abroad can also be arranged, but as a private contract by the families who must pay for this since it no longer falls under the provision of the NHS. Small portable oxygen concentrators are sometimes purchased by families and may be a less expensive option. Oxygen makes things burn more readily and caution is required near open flames or generated sparks. Cigarette smoking, gas cookers, open fires and candles are potential hazards.195 Smoking in the home should be strongly discouraged. In a study of burns affecting 27 adults on home oxygen, 89% were smoking at the time.196 Large cylinders need secure fittings when upright at home and during transportation. Smaller portable cylinders need to be securely attached to wheelchairs, prams and buggies with a sufficiently strong undercarriage to support the weight of a full cylinder. A structured education programme should include vigilance for an empty cylinder, dislodged cannulae or blocked valves. Early discharge of an infant with CNLD on home oxygen can add emotional as well as financial burdens for the family. This includes caregiver fatigue, social isolation, marital conflict and anxiety regarding potential problems and sibling difficulties; there are also financial demands associated with marital status, reduced income and lack of respite or nursing help.74 76 197 Many of these issues relate to looking after an unwell child and are not necessarily associated with the home oxygen itself. Parents’ perception of a stable income was significantly associated with positive coping.76 Stress may result from issues of privacy, confidentiality and conflict with professional care providers in the home.170 198 Mothers have also been reported to show low self-esteem, self-blame, elements of grief and isolation;170 they also reported significantly less vitality and more mental health problems than mothers of infants not receiving home oxygen.199 On the positive side, parents feel that the benefit of having their child at home outweighs their anxiety,77 and the increased anxiety levels after hospital discharge decrease as they see their child’s oxygen dependency resolving.174 Clearly, emotional support is necessary from family, friends and the healthcare services. There is also an adverse psychological impact for older children receiving home oxygen. This mostly relates to the fact that it is often (rightly) taken as an indicator of a serious deterioration in the child’s condition. Oxygen at school is another visible aspect that sets the child apart from his/her healthy peers. How often inappropriate (next day) prescribing happens. Quality of prescribing data on HOOF. Parental satisfaction with discharge procedure. How often GP informed before discharge. Adherence to oxygen regimen by patient. How often patient visited at home and timing of such visits. How often Spo2 monitored—during both stable and withdrawal process. Appendix 2: Checklist of topics for educating those involved with the care of the child. This guideline has been endorsed by the Royal College of Paediatrics & Child Health.